October 4, 2017 By Aileen Leave a Comment This post contains affiliate links. As an Amazon Associate and member of other affiliate programs, I earn from qualifying purchases. I whipped up this one pot meal in less than 20 minutes the other night. My husband was surprised when he came in the house and dinner was already on the table. 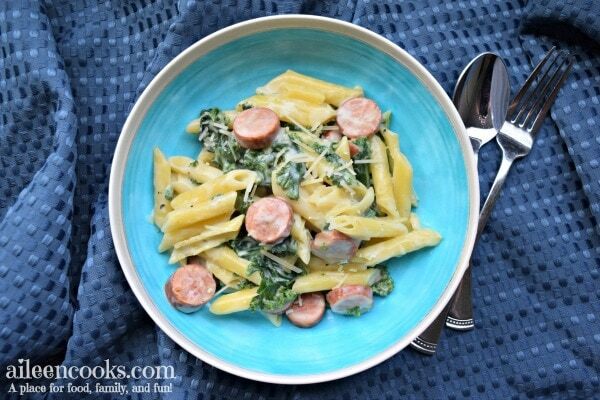 He was even more surprised when he realized how delicious this one pot smoked sausage and kale pasta was. It’s creamy, filling, and flavorful. This season of life has been really busy for us and we are basically living off of quick and easy meals. With our oldest in PM Kindergarten, our middle in morning preschool, and our youngest walking and climbing, and getting into every cabinet in our house – life is crazy busy. As much as I love being in the kitchen, it’s just a really hard time to find tons of time to dedicate to cooking. I would much rather spend that time around the dinner table with my family. This recipe save me this week. Even if I feel like I’m failing in most of the other areas of motherhood right now, I fed my family. And it wasn’t from a drive-thru. 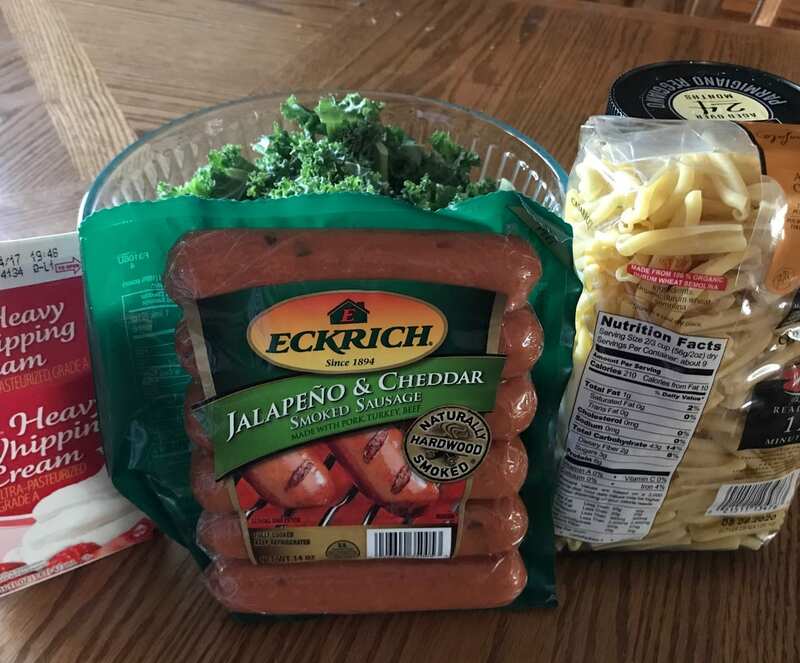 The sausage in this 20 minute meal is Eckrich Jalapeno and Cheddar Smoked Sausage Links. 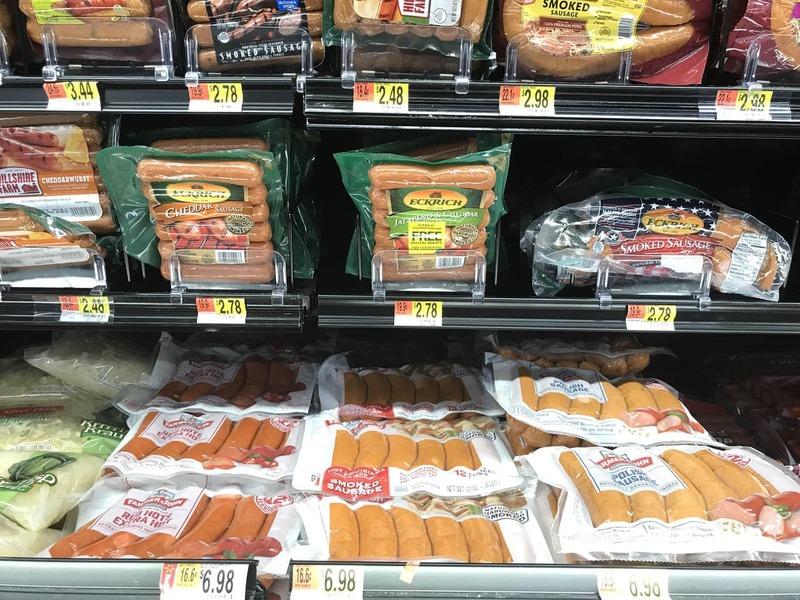 The flavor and versatility of Eckrich Smoked Sausage enables us to prepare a wide variety of delicious and satisfying meals with confidence in no time. You can pick them up at Walmart. Eckrich Smoked Sausage makes it easier to get the family to gather around the table at mealtime. It gives us more time for other important things to our family, too! This smoked sausage is fully cooked, so you just throw it in the pot with your ingredients and it’s ready whenever everything else is cooked. It has a great flavor, but isn’t too spicy (aka kid friendly). It is naturally hardwood smoked for a true smokehouse taste. This dish is one of those recipes that cooks all in the same pot. 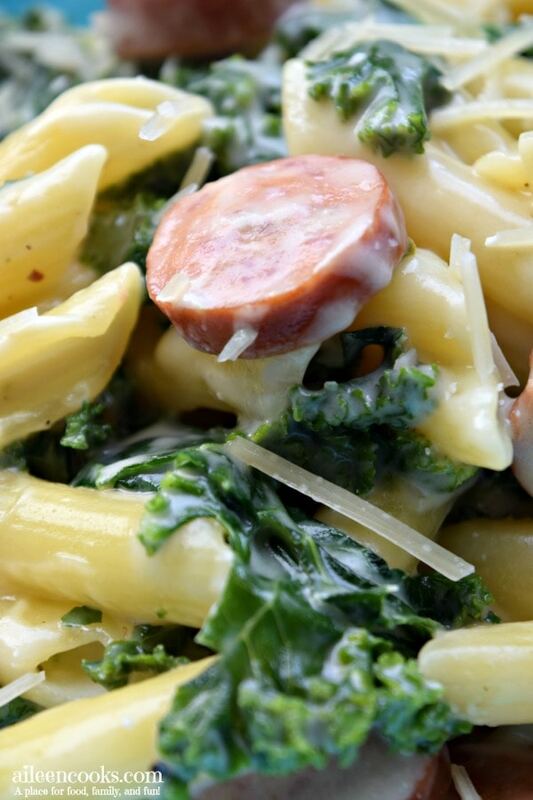 You start by sauteing the kale in a bit of olive oil and salt, tossing in the smoked sausage, chicken broth, and pasta. Then, just stir it until the pasta is al dente. 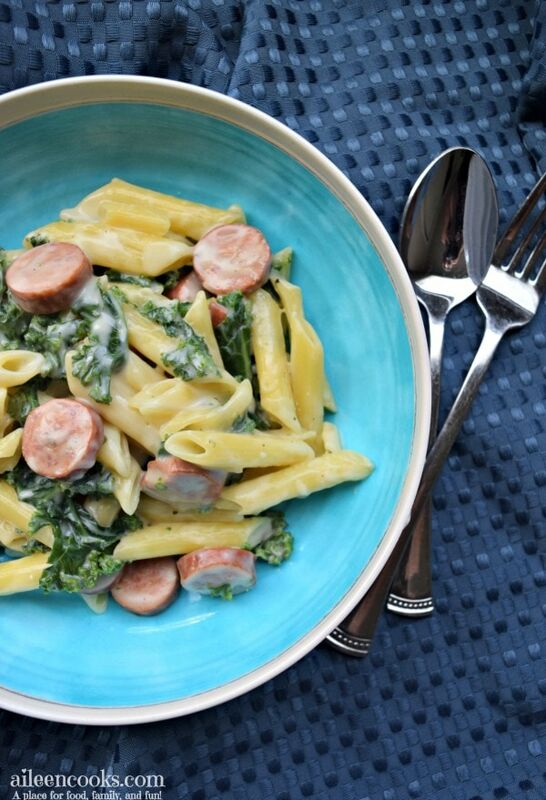 One pot smoked sausage and kale pasta. 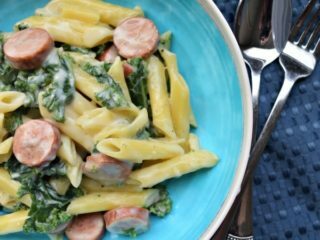 A delicious one-pot pasta dish, perfect for busy weeknights. Saute kale until it begins to shrink up, 2-3 minutes. 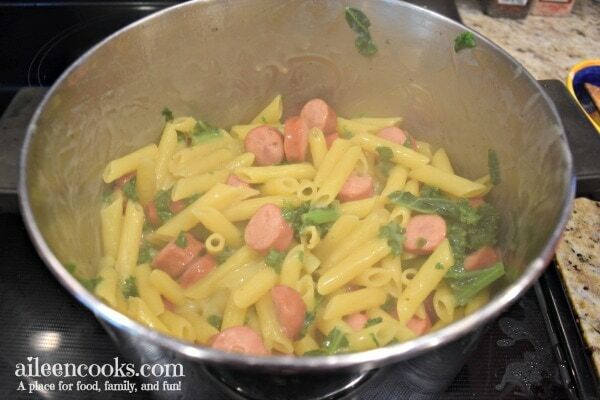 Mix in smoked sausage, chicken broth, water, and penne pasta. Stir constantly and cook until pasta is al dente, about 10 minutes. Mix in heavy whipping cream and Parmesan cheese. Stir until cheese is melted. If you like this recipe, please consider rating it and leaving a comment below. 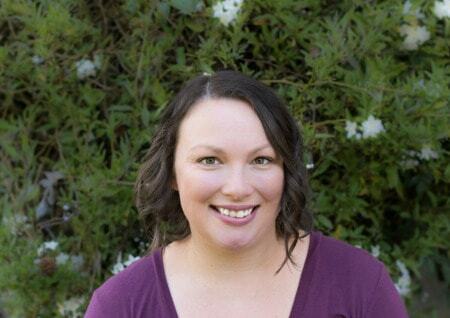 You can also follow me on Facebook and Instagram.